V4 Report. Sebastian Kurz is young, but he grasps reality on migration and the future of EU funds. With Brexit pending, why seek new avenues or “EU taxes” for lost revenue? The real goal should be to downsize the EU by drastically reducing the funds being sent by all nation states to Brussels in the first place. 1). 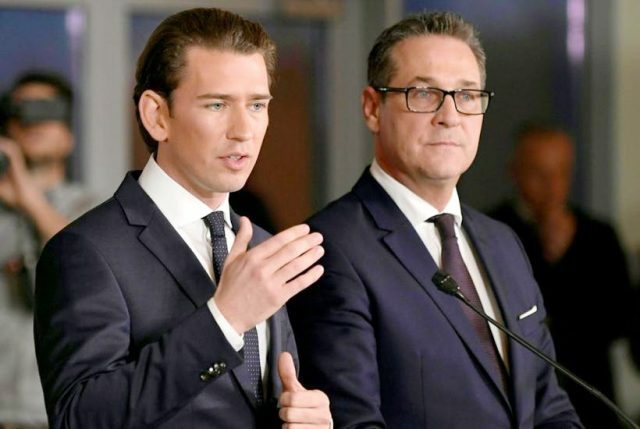 Kurz told the daily Der Standard that the Austrian government saw eye-to-eye with the V4 on both the rigorous protection of the external borders and clamping down on illegal migration. Austria’s defection from Germany over migration was vital for Visegrad in their upcoming battle this June with France and Germany (and their followers in Western Europe) over the forced migrant quotas. It is important that both the V4 and Austria build a solid alliance of CEE states to challenge the arrogant multicult demands of Western Europe. 2). At the same time, Kurz spoke realistically that Central European countries should count on receiving less funds from the EU budget in the future. As long as the cuts are not related to the migrant quotas and there are no additional revenue demands from Brussels, Kurz has a valid point. This is rather obvious given Britain’s pending departure (less revenue), but it’s also part of a natural cycle of development. Although they rarely talk about it – following World War II – Western Europe relied upon America to provide the funds and assistance to rebuild their infrastructure and economies. America invested $13 billion ($130 billion in today’s dollars) into Western Europe. Of course, Stalin rejected the plan for the eastern bloc. The United Kingdom received 26% of the funds, while France 18% and West Germany 11%. The United States was not just handing out money to be a “nice guy”; they were fully aware that in order to maximize their economy they needed a strong market in Europe. As Europe lay wounded, they needed help to rebuild the devastated infrastructure and to raise the standard of living. After all, it is much easier to export goods to people who have the money to buy them. The Marshall Plan helped get Europe back on track to the point where the ingenuity of the Europeans, Germans mostly, were able to capitalize on that seed money to become vibrant economies. In the end, Europe benefited, but the American economy prospered even more so. The same can be said in regards to Western Europe and Visegrad. As we have documented over these pages, many Western firms have benefited quite handsomely from this investment in Visegrad. No one knows this better than Germany. However, the V4 nations are now thriving and should welcome less dependency on EU funds, which is not the only reason why they have some of the highest rates of growth in the EU. Instead, they must strive to keep and strengthen their attractive business environment while looking for other opportunities outside of the EU. If they remain attractive, they will discover new paths and will continue to attract private investment and foreign capital. The main risks could emerge from the EU bureaucracy and Macron’s movement towards federalism, plus any new attempts for an EU tax to increase revenue for an already bloated bureaucracy in Brussels. For example, emerging markets like Visegrad require much different needs than developed economies like France and Germany. One “anti-competitive” measure is to “level” the corporate tax rate across the EU. The V4 and CEE nations must fight to defeat any type of scheme designed in Paris or Brussels to “harmonize” coporate tax rates or to create burdensome regulations that benefit the developed economies at the expense of the emerging markets. The real issue is not “where to find lost revenue” but where to cut back. Brussels is a monstrity, full of political opportunists and naive plebes who feed off the government system while meddling in the affairs of the nation states. They must be the first target for heavy cutbacks and massive layoffs. If Brussels is not dramatically scaled back today, they will keep slowly expanding their scope and power until Martin Schulz and Guy Verhofstadt achieve their dream of a Federal Europe. Sometimes people believe the EU “Fairy Godmother” produces revenue. She does not. There is nothing special about the EU. The core foundation of Europe is not Frans Timmermans, Dimitris Avramopoulos or some clerks in Brussels, but the European nation states and their people. The EU cannot just be “reformed”, it must be drastically scaled back. However, many in Brussels will not yield their seats of power without a fight. The question to our readers: Can it be done or will the EU have to be broken first? Italy warns of ‘Real risk’ of Islamic State fighters on migrant boats.